SiteGround was established back in 2004. They were a local web hosting provider in Bulgaria (Sofia). Since then, they have improved their service and added a lot of services other than web hosting services. On the contrary, Bluehost is another internationally recognized web hosting provider. They are based in Orem, Utah. Although they’ve begun in 2003, they are now powering about 2 million websites all around the world. 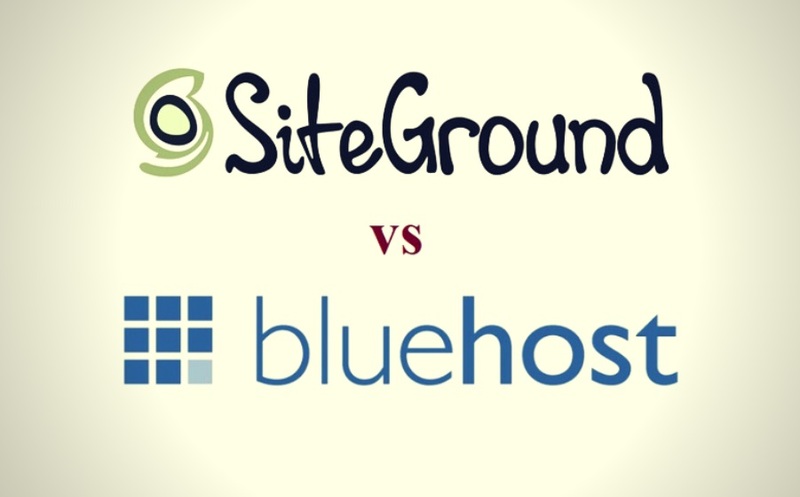 You could be in a dilemma whether you should go with SiteGround or Bluehost. We all get confused when it comes to deciding the best web hosting provider for ourselves. Thus, in today’s post, we’ll be comparing all of the services and the performances of both of these companies for you. So that you can make your decision without any hassles. At first, we’ll compare all the different kinds of hosting services of Bluehost and SiteGround. Let’s start with shared hosting services. They have three shared hosting packages which are StartUp, GrowBig, and GoGeek. Let’s take a deep look at these packages. By paying only 3.95$ each month, you can get this shared hosting plan. This is the most basic package available from SiteGround. You’ll receive 10 GB storage which is suitable for 10,000 visits per month. The problem with this package is that you are able to host only one website. This package also includes the ‘Essential Features’ from SiteGround. Right now, the ‘GrowBig’ plan is the best-selling shared hosting package from SiteGround. Because it’s very reasonably priced but you can host more than one website. It also comes with both the ‘Essential’ and ‘Premium’ hosting features of SiteGround. It will cost you only 5.95$/monthly. And, you’ll get 20GB storage. It’s suitable for 25,000 visits per month. This package comes with some of the most advanced hosting features from SiteGround. Thus, it will cost you the most. The price of the ‘GoGeek’ plan starts at 11.95$/month. This package includes 30 GB storage. And, you’ll get all the ‘Essential’, ‘Premium, and ‘Geeky Advanced’ hosting features with this package. This package is suitable for about 100,000 visits per month. In total, there are 4 shared hosting packages available from Bluehost. The name of the plans are Basic, Plus, Choice Plus, and Go PRO respectively. Let’s know a little bit of detail about these plans. The Basic Plan has the lowest price. You can get it by paying as low as 2.95$ per month. However, there are a number of limitations using this package. First of all, you cannot host more than one websites with this package. And, you’ll also get limited web space (50 GB). Although the package includes unmetered Bandwidth, you can add only 5 Parked Domains, 25 Sub-domains, and 5 custom Email Address (100 MB/per account). Added to that, you’ll not get any advanced features with this package. So, if you want to host only one website within a reasonable price then this could be a good option for you. If you’re going to host multiple websites on your hosting account then you should use the ‘Plus Plan’. It will cost you 5.95$ each month. And, you’ll get unlimited storage space, Unmetered Bandwidth, unlimited parked domain/subdomains etc. But this plan doesn’t include some of the advanced hosting features. You have to pay at least 5.95$/monthly for this package. Yes, the price of this plan is the same to the previous plan. But, you’ll receive some of the advanced hosting features (SpamExperts, Domain Privacy, and CodeGuard Basic) with this package. Also, you can host unlimited websites using this package. You’ll have unlimited storage, bandwidth, subdomains, email accounts etc. So, in a way, this is the best package for your money. Thus, even Bluehost also recommends this package officially. This is the best shared hosting package from Bluehost. Also, it’s the highest priced plan. With this package, you’ll get free Dedicated IP, CodeGuard basic, SpamExperts, SSL certificate etc. However, the best thing about this package is that you’ll also receive a high-performance server. As a result, even though you’ll be using a shared hosting account, your website will perform better because of the high-performance server. The price of this plan starts at 13.95$ per month. Along with these, you’ll get a chance to get a domain name for free for 1 year with each Bluehost hosting account. And, you’ll also receive free SSL certificates with your hosting accounts. 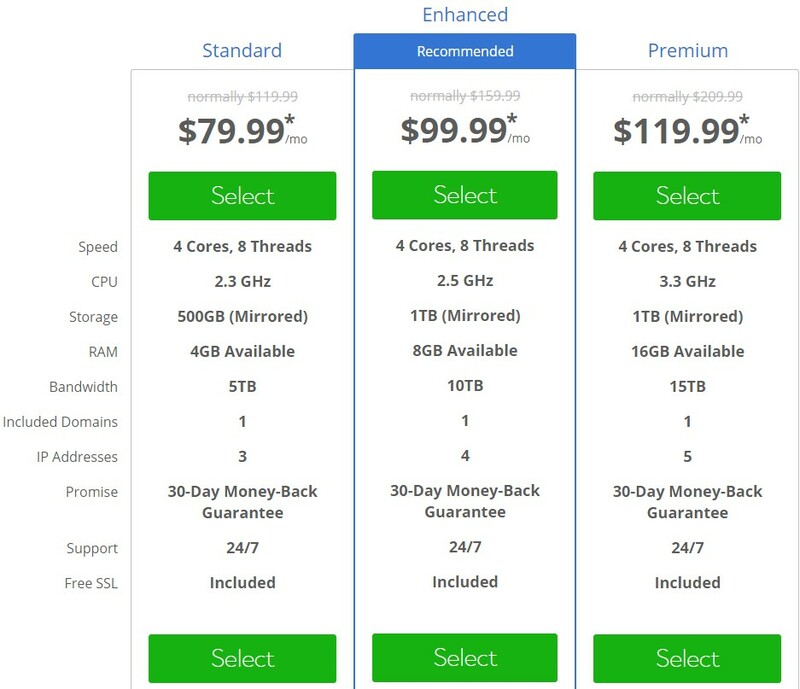 At the first look, it’s easy to notice that the prices of both hosting companies are almost identical. But, Bluehost is offering a free domain name for 1 year with every package. This is a very good reason to choose them. We can’t deny that. However, SiteGround actually comes with more specifications than Bluehost. All of the shared hosting plans of SiteGround are very feature-rich. As you might already know that they come with 3 different sets of features. 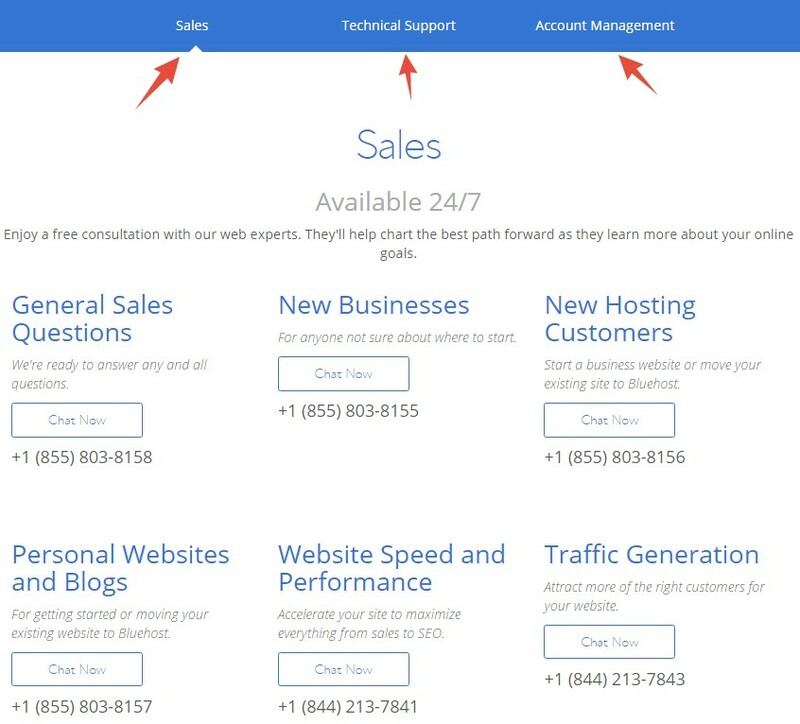 Some of the features offered by SiteGround are very unique and useful. Yet, you won’t find those advanced features on any of the shared hosting packages of Bluehost. So, if you want to get the best performance on your website, you should go with SiteGround. Even though they don’t offer a free domain name with their package. They are offering 4 cloud hosting packages which are known as Entry, Business Plus, Business, and Super Power. Along with these, you also can order a custom-made plan for yourself. We’ll talk all about it down below. The first plan will cost you at least 80$/monthly. The specifications of this package are 4 GB RAM, 2 CPU Cores, 40 GB SSD storage and 5 TB Bandwidth per month etc. The second one is priced at 120$ per month. SiteGround will provide 6 GB Memory, 5 TB Bandwidth, 3 CPU Cores, and 60 GB SSD storage etc. with this package. If you’re looking for a decent cloud hosting plan, then you’ll like this one. You have to pay at least 160$ per month to get this package. And, in return, you’re getting 4 CPU Cores, 80 GB SSD storage space, 5 TB Data Transfer, and 8 GB RAM etc. with this package. Now, we’ll be sharing the details of the most high-priced cloud hosting package of SiteGround. If you have more than one high-traffic websites then you should get this package. You have to spend at least 240$/monthly for this package. In exchange, you’ll be receiving 5 TB Bandwidth, 8 CPU Cores, 10 GB RAM, 120 GB SSD Storage etc. Sometimes, the pre-made plans are not enough. In that case, you might need plans which are tailored to your needs. With SiteGround, you can choose all the specifications of your plan depending on your needs. And, then you can order that. They will set up the account later on according to your order. However, the price of the custom-made plan will vary based on the specifications. As for Bluehost, they do offer Cloud Hosting. However, those plans are modified from their shared hosting plans. So, we can’t compare them with SiteGround’s advanced cloud hosting plans. Instead of this, Bluehost offers VPS hosting which can be compared with the SiteGround Cloud Hosting plans. So, we’ll be sharing the details of the Bluehost VPS plans down below. Bluehost comes with 3 VPS hosting plans, they are known as Standard, Enhanced, and Ultimate respectively. Let’ learn more about them. It will cost you only 19.99$/monthly. In return, you’re getting 30 GB SSD Storage, 2 GB RAM, 1 TB Bandwidth, Dual Core CPU, 1 dedicated IP address etc. The ‘Enhanced’ VPS plan comes with 2 TB Bandwidth, 60 GB SSD Storage, 4 GB of RAM, 2 dedicated IP, and 2 cores CPU etc. The Price of the plan starts at 29.99$ per month. This is the best VPS package from Bluehost. As usual, this will cost you the most. It comes with 4 Cores of CPU, 8 GB RAM, 3 TB of Bandwidth, 120 GB SSD Storage, and 2 Dedicated IP addresses etc. And, you’ll have to pay at least 59.99$ each month for this package. It’s hard to compare two different types of hosting service. For instance, you can see that the highest priced VPS plan of Bluehost is 59.99$/monthly. 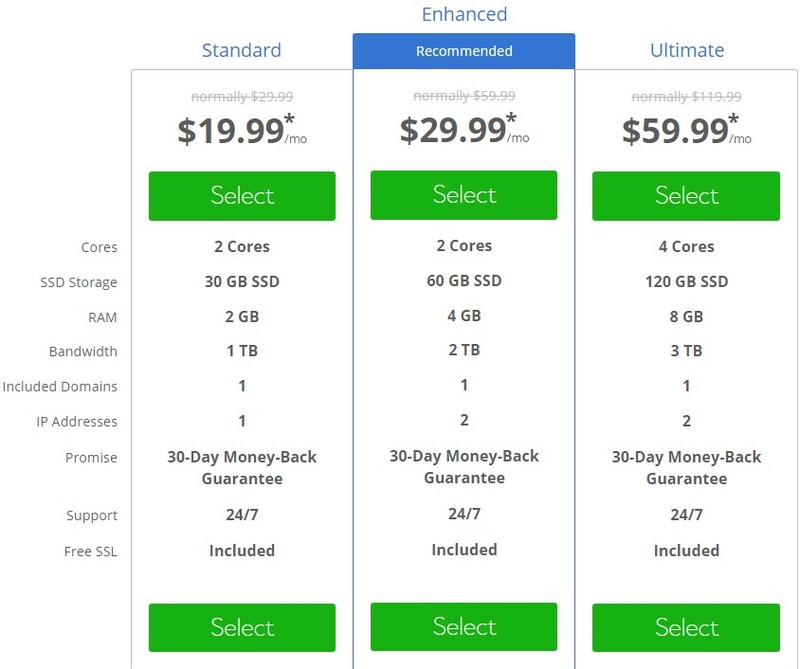 Oppositely, SiteGround’s lowest priced advanced cloud hosting plan starts at 80$ per month. 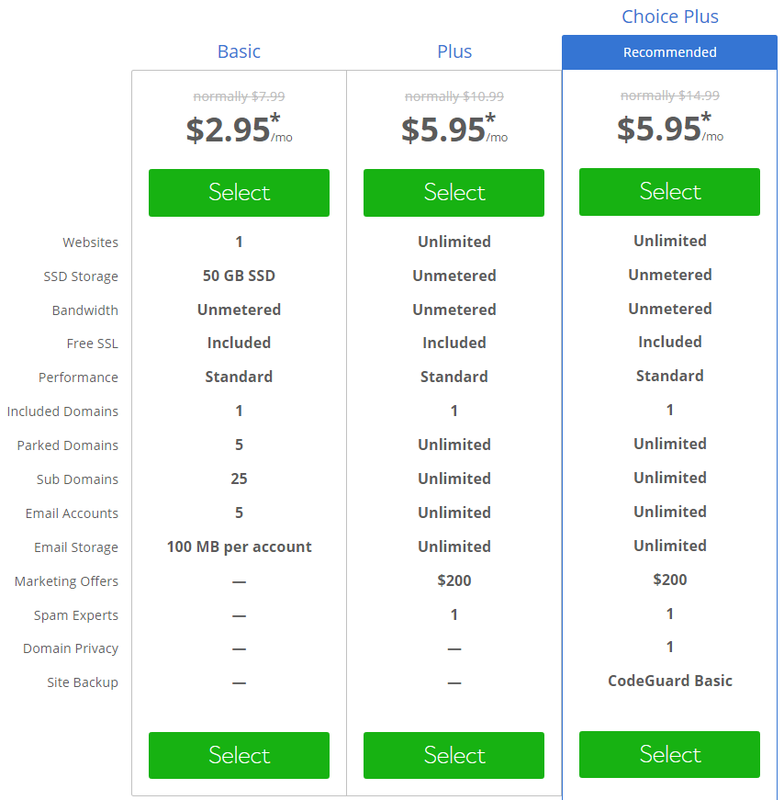 So, if you compare the price then Bluehost wins easily. Yet, if you talk about the specifications and the quality of the servers and services then SiteGround wins by miles. So, it totally depends upon your requirements. But, we’ll recommend SiteGround Cloud hosting plans over the VPS hosting plans of Bluehost. All of the dedicated hosting plans of SiteGround is very high-priced because of their high-end specification. We have reviewed a lot of hosting companies till date. However, among all them, SiteGround seems to have the most high-end dedicated servers. Also, they provide dedicated servers based on 3 locations. You can get your server from Europe, USA, and Asia-Pacific. In total, they have 3 dedicated hosting plans. They are Entry, Super Power, and Power. Let’s take a quick look at these packages. The ‘Asia-Pacific Entry’ server is not available at the time of writing this post. However, you can get this plan if you want a server based on the USA or Europe. It will cost you 269.00$/monthly to use this plan. The server will contain 10 TB of Bandwidth, 480 GB storage Space, 16 GB RAM, and an Intel Xeon E3-1230 CPU (8 threads, 4 Cores, 3.20 GHz). 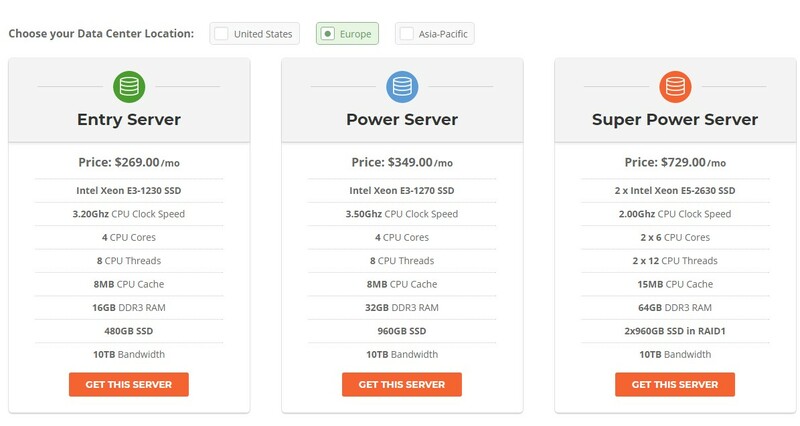 If you get the USA or Europe based Power server then you’ll have to pay 349.00$/month. But, for the Asia-Pacific based server will cost you 609.00$ each month. The specifications of the ‘Power’ server is 960 GB of SSD Space, 10 TB of Bandwidth, an Intel Xeon E3-1270 CPU (8 threads/ 4 Cores, 3.50 GHz), and 32 GB RAM etc. Now, we’ll be sharing the information about the most robust dedicated server provided by SiteGround. First of all, let’s know about the specifications. The server will come with 10 TB Bandwidth, 2 x Intel Xeon E5-2630 CPU (2 x 12 threads, 2 x 6 Core, 2.00 GHz), 15 MB of CPU Cache, and 64 GB RAM respectively. Added to that, you’ll get the RAID 1 feature for your storage. In other words, your data will be mirrored on two 960 GB SSD. 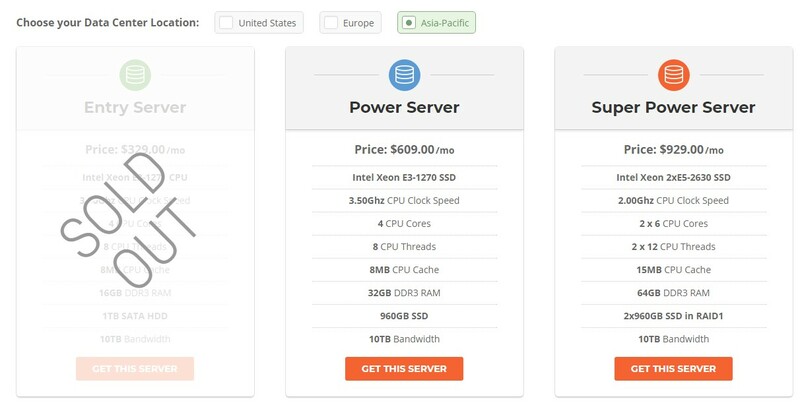 The price of the USA and Europe based server is 729.00$ per month. In contrast, the price of the Asia-Pacific based server is 929.00$ every month. There are three dedicated hosting packages from Bluehost. They are known as Standard, Enhanced, and Premium respectively. Let’s know a little bit about these packages. If you want a basic dedicated server then you can begin with this package. This will cost you at least 79.99$ each month. The package includes 500 GB Storage (Mirrored), 4 GB RAM, 5 TB Bandwidth, 2.3 GHz CPU (4 Cores, 8 Threads), and 3 dedicated IP addresses etc. This server will come with 1 TB Storage (Mirrored), 8 GB of RAM, 2.5 GHz CPU (4 Cores, 8 Threads), 4 dedicated IPs, and 10 TB Bandwidth etc. You can get this plan by paying at least 99.99$ per month. This is the officially recommended dedicated hosting plan by Bluehost. This package is priced just at 119.99$/monthly. And, you’ll be provided with a 3.3 GHz CPU (4 Cores, 8 Threads), 16 GB RAM, 15 TB Bandwidth, 5 IP addresses, and 1 TB of SSD storage (Mirrored) etc. It’s pretty clear that SiteGround has higher priced plans than Bluehost. But, if you take a closer look at the specifications you can see that SiteGround has the better ones. Also, SiteGround is offering location-based servers which aren’t available on Bluehost plans. Added to that, you’ll get more hosting features with the SiteGround dedicated hosting plans. So, if you don’t have any problems regarding your budget then go with SiteGround. That way, you’ll get the best performance from your websites. 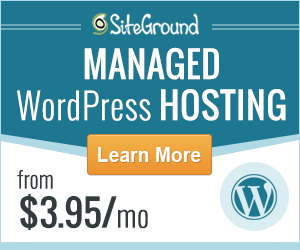 SiteGround offers managed WordPress hosting service. However, there are not any special WordPress related plans. Instead of that, they are providing a slightly modified version of their shared hosting packages as WordPress hosting packages. Also, the price and the specifications of these plans are similar to the shared hosting plans. The names of these plans are also the same which are ‘StartUp’, ‘GrowBig’, and ‘GoGeek’. So, we won’t cover them again. But, all of the features of these plans are specially designed for WordPress websites. WordPress will come pre-installed with your account. So, you can launch your site from the moment you get a hand on your account. Siteground also offers several WordPress based plugins. For example, you’ll have the ‘SiteGround Migrator’ plugin. With the help of this, you can transfer your previous WordPress sites with just a few clicks. Another awesome plugin is their ‘SuperCacher’ which will boost the performance of your websites by a huge margin. Conversely, Bluehost comes with 3 special WordPress hosting plans. The names of the plans are Build, Grow, and Scale. Now, Bluehost doesn’t disclose the specifications of the packages. Rather, they tell that there are no limitations on your package. The details of the plans are described below. This plan comes with all the basic features needed for a WordPress website. The price of this plan starts at 19.95$ per month. This will come with 100 free WordPress themes, daily backups, domain privacy etc. The Grow plan will come with every feature of the ‘Build’ plan. It’ll also contain additional features. The plan will cost you at least 29.95$ per month. You’ll get some Business review tools, Bluehost SEO tools, spam protection etc. with this plan. You’ll have to spend at least 49.95$ per month for this package. This plan comes with everything of the ‘Build’ and ‘Grow’ plan and some other additional features as well. You’ll get the ‘Jetpack Pro’ version for free with this package. Besides that, the plan includes features like unlimited backup and restore, PayPal integration, unlimited video compression etc. 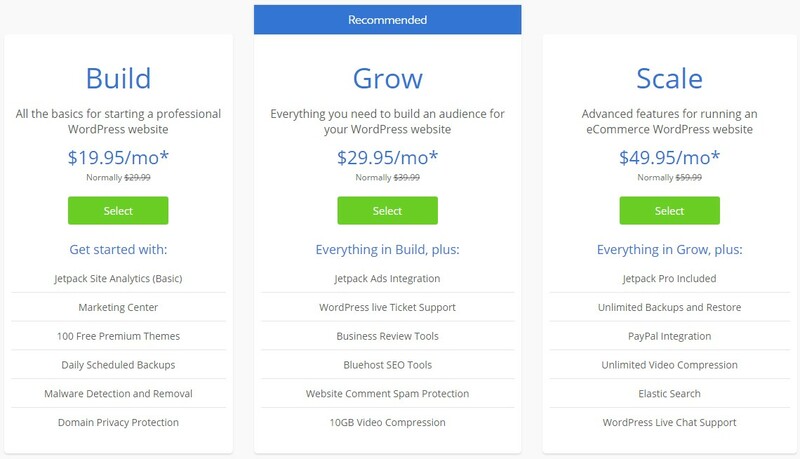 In this case, the price of the WordPress plans of SiteGround is lower than Bluehost. But, the problem with Bluehost is that they haven’t disclosed the detailed specification of the plans. On the opposite, SiteGround has made everything clear about their plans. It might seem that Bluehost is offering more WordPress related features. But that is not the case at all. In reality, most of the features provided by Bluehost can be replicated by free plugins. So, we think you shouldn’t spend such amount of money for some tasks which you can perform for free. That is why we are with SiteGround this time. If we don’t compare the performance of both of these hosting providers, this post won’t be completed. So, in this section, we’ll be putting both of these hosting services to a couple of performance tests. 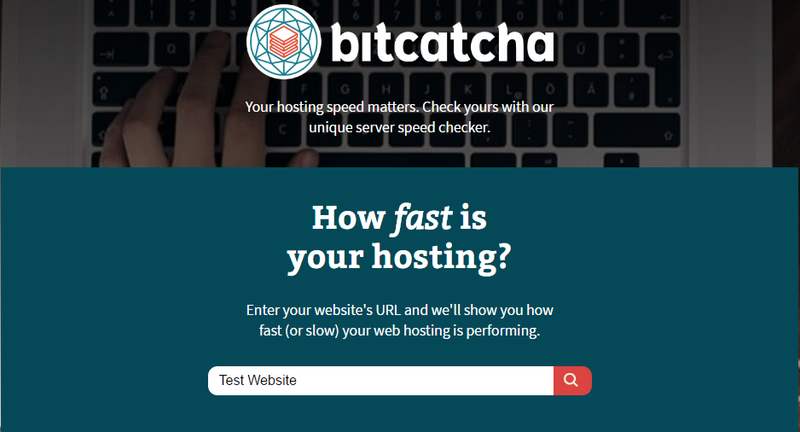 First, we’ll test the load speed of two sites which are hosted on Bluehost and SiteGround respectively. Then, we’ll test the response time of the servers of these hosting services. So, let’s begin. Here, we’ll be using Pingdom — a popular website known for speed test. They have set up many test servers for this test all over the world. We’ll be using the Stockholm server this time. And, we’ll use a website which is hosted on SiteGround to get the accurate result. Here, the ‘Load Time’ is the indicator of the performance. If the ‘Load Time’ is lower then it’s a good sign. In this case, we see that our test site was loaded in 685 ms. That’s so fast. And the performance grade was ‘A’ (the highest grade). The test will be conducted from the San Francisco test server of Pingdom. From above, we see that the performance grade of the website hosted on Bluehost is ‘B’. That is not bad, yet SiteGround has done better. And, the ‘Load Time’ is 824 ms. Again, SiteGround was faster than this. From both of the tests, it’s easy to notice that the particular site hosted on the Siteground performed faster and better than the website hosted on Bluehost. Although the page size of the Siteground site was higher than the Bluehost site. So, we can draw our conclusion here by stating that SiteGround is the best when it comes to fast website loading speed. This is a test which will be performed with the aid of Bitcatcha website. They have set up test servers on 8 different locations throughout the world. With the help of this test, we can know the response time of the servers of any particular web hosting company. Right now, we’ll be testing the server response time of a website which is hosted on SiteGround. Remember, if the response time is lower then it’s better. On this test, our test site performed very well. The site got an ‘A+’ on the performance grade. And it’s the best possible grade. When it comes to the response time, it is evident the server response times were also low from each of the 8 locations. So, all in all, it’s looking good for SiteGround. Now, we’ll test the server response time of a website hosted on Bluehost. So, the site hosted on Bluehost got an ‘A’ on the performance grade. To be honest, that’s not bad at all. Yet, SiteGround got the highest grade. The ‘Response Times’ was also good. If we compare both of the results, then it’s clear as daylight that SiteGround has got the best result. So, once again, we should say if you’re looking for performance then you must choose SiteGround. At this point, we’ll analyze the uptime stat of both of these hosting companies. Then we will compare them. 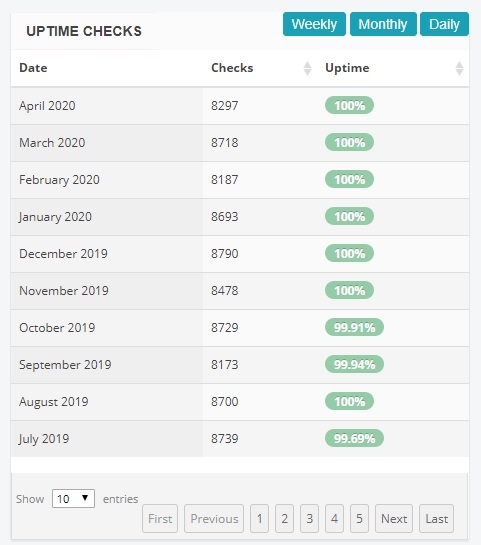 To get the real uptime stat of any web hosting service, you should host a website with them and then you need to keep monitoring their uptime status regularly. However, we know that is not possible for everyone. That’s why we have done that for you. We have hosted two websites on both SiteGround and Bluehost. And, we are keeping the track of their uptime stat constantly. In fact, our website (ReviewPlan.com) is one of them. We have been using SiteGround for a long time without any issues. 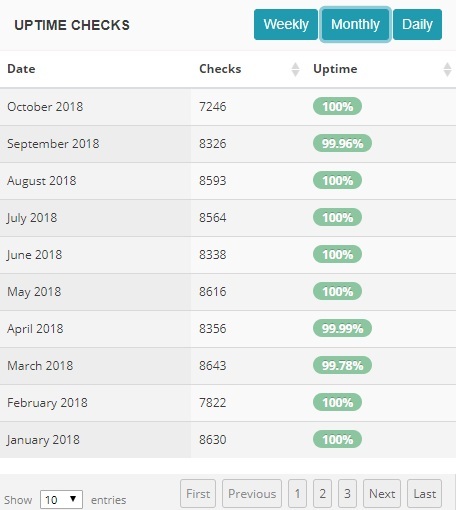 You can find the uptime stat of both SiteGround and Bluehost below. It’s hard to pick a winner here. You can recognize that both of the hosting providers have kept almost 100% uptime most of the times. So, we can say that they are maintaining the industry-standard uptime with ease. So, we’ll not choose the winner here. Instead, we are leaving it up to you to decide. Let’s compare the support service of both of these web hosting services. They offer 24/7 customer support. You can reach them via Email, Direct Call, Live Chat, and Ticket etc. On some occasions, we have had to contact the SiteGround customer care service. Every time, our experience was over the top. All of their customer support staffs are highly-skilled and fast. If you use the ‘Live Chat’ option then most of the times you will get a reply within just 10-15 seconds. They also have a lot of web hosting related articles and videos. You can learn all about website management from those articles and videos. If you do that you might not even need to contact them in the first place. All in all, their service was satisfactory to us. Similarly, Bluehost is also available 24/7. You can communicate with them from anywhere in the world. They also offer similar methods offered by SiteGround to contact them. We have contacted them several times as well. Most of the time, their service was good. The only problem with them is that sometimes you might have to wait more than a couple of minutes to receive a reply from their customer representatives. Other than that, they’re professional and polite. So, you won’t have any problem communicating with the customer representatives of Bluehost. If you want a straight answer then the winner is SiteGround. Now, let’s clarify this. First and foremost, it’s plain to see that the plans of Bluehost are cheaper than SiteGround. So, you might think that they are the better option. Yet, if you compare the specifications and features of each hosting companies, then you’ll see that SiteGround has got the advantage here. Again, we have tested the performance of these hosts. On both of the tests, the winner was SiteGround. Usually, there’s no problem if you want to use Bluehost depending on your circumstance. They are also not that bad. They came in so close in some instances. Yet, SiteGround was far better on some other instances. So, all things considered, the winning vote belongs to SiteGround.